Today, half of all plants bought in garden centers and nurseries end up planted in containers. The attraction? It makes us feel good to have some of our favorite plants close by where we can view them frequently and care for them easily. This means plants near the front and back doors, hanging from window sills and sitting on the patio. Using containers in the garden is a great way to add diversity and flexibility. Containers are my solution to coping with an inhospitable, gravelly, lean soil and unforgiving, intense sunlight. With containers, I can grow the plants that I like and I grow them where they thrive best – instead of being restricted to growing only the plants that will survive in full sun on droughty soils. In my case, thanks to numerous containers, I garden under a large oak tree, on the patio, and under the front porch overhang. I can now grow fresh herbs: basil, mint, coriander, and dill; showy flowering plants like the pretty mini petunias called Calibrachoa; try a new dwarf butterfly bush shrub, and have success growing Iresine ‘Blazin’ Lime’ with its tender but pretty foliage colors, all that I would not have been able to grow in garden beds. 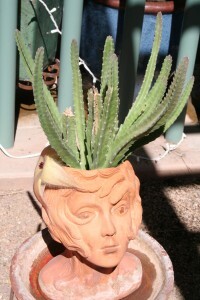 Having fun with unusual plants and containers can lead to some really creative pairings. Containers make gardening happen … anywhere. For people that like to rearrange the furniture, containers make quick work of filling in a blank spot, adding pizzazz to a dull area, hiding an unsightly object or just creating a new spur of the moment accent. 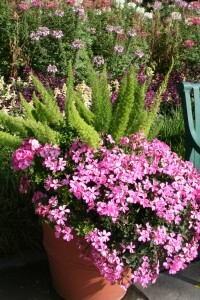 The uses for container plants are quite varied; to move tender plants outside for the summer, to grow specialty plants that require a different soil mixture, to restrict plant growth through bonsai or penjing, to control invasive plants such as the notorious mints, to create small-scale water gardens, and they really are the best way to display weeping or trailing plants. Container gardens are also an economical way for a new homeowner or beginning gardener to get started, they require no digging and little weeding, and are easy to change the soil or plants from year to year. Best of all, if you become really attached to your plants and have to relocate, like I have done – your container garden can move with you. It’s not all easy gardening though – containers do take a bit of planning so compatible plants are selected. Not all plants are suitable and many full-sized vegetables are better grown in the ground. Containers limit the ultimate size of plants too. So if you are planning to grow the world’s tallest tomato plant, don’t settle for anything much smaller than the world’s largest container either. Container gardening takes more of a commitment than in-ground growing, often requiring rigorous watering, fertilizing and pruning routines. Miss one watering during a critical hot, dry day and the result could be stressed out plants. Hot, summer winds also cause plants to dry out faster in containers and mature plants have a tendency to blow over when the soil dries out. There’s also the possibility of salts building up in the soil and the need for leaching to flush this out. And lastly, it’s easy to overwater plants if drainage holes get plugged. 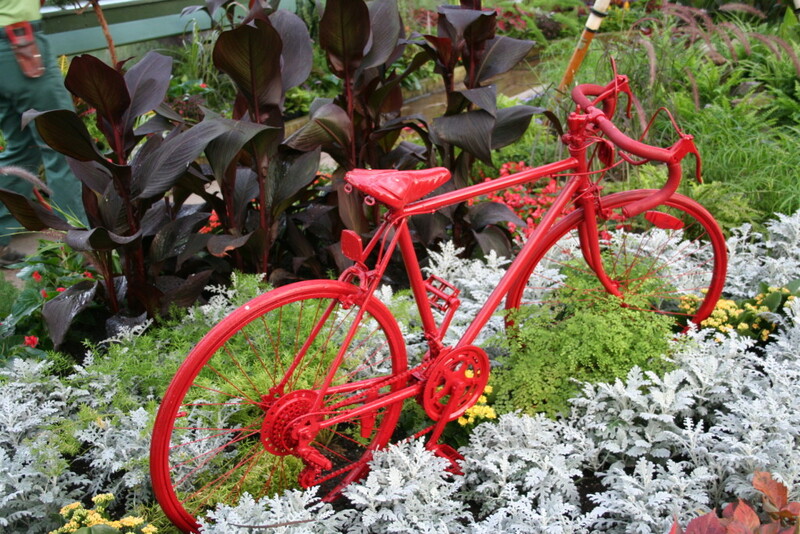 First think about your garden style. Try to match your container to the style of your garden. Is it formal, informal or cottage style, new American garden style with masses of native plants and ornamental grasses, or is it a garden of reclaimed objects with a tractor tire planters and bottle trees? After matching the style, consider the number of different materials (stone, brick, wood, metal, glass, plastic) that are being used in the hard landscape and try not to exceed more than three or four types including the containers. 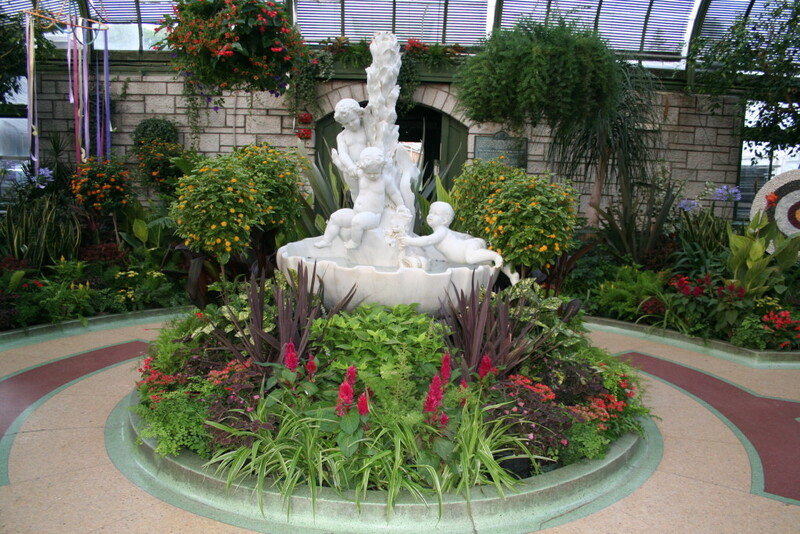 Often containers are just as important to the overall visual display as the plants they hold. Containers provide structure for living plants and should be included as part of the hard landscape plan. Don’t have so many “hard” features that they detract from the plants and steal away the impact. A garden is for plants, right? 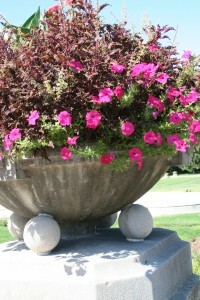 Consider the balance or scale of the container to the plants. Avoid a top heavy or bottom heavy design. 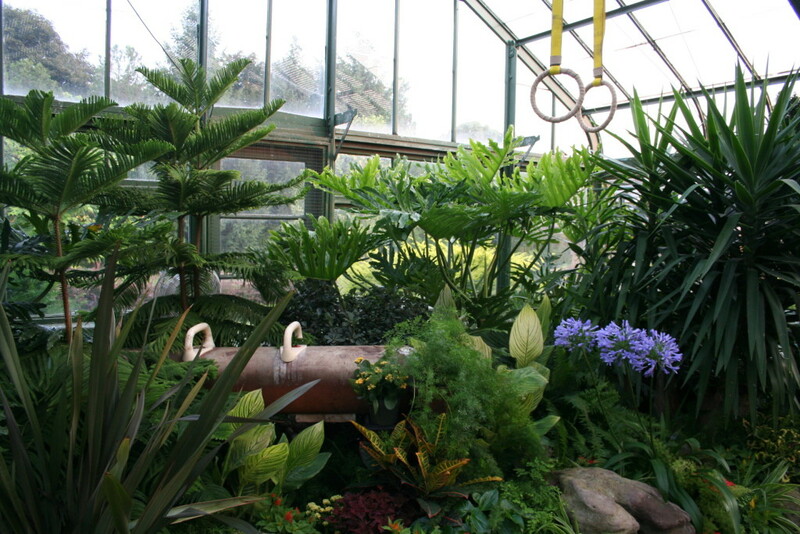 Use trailing or upright plants to get the right scale. The size (weight or mass) of the container should be equal or ½ of the collective volume of the plants. 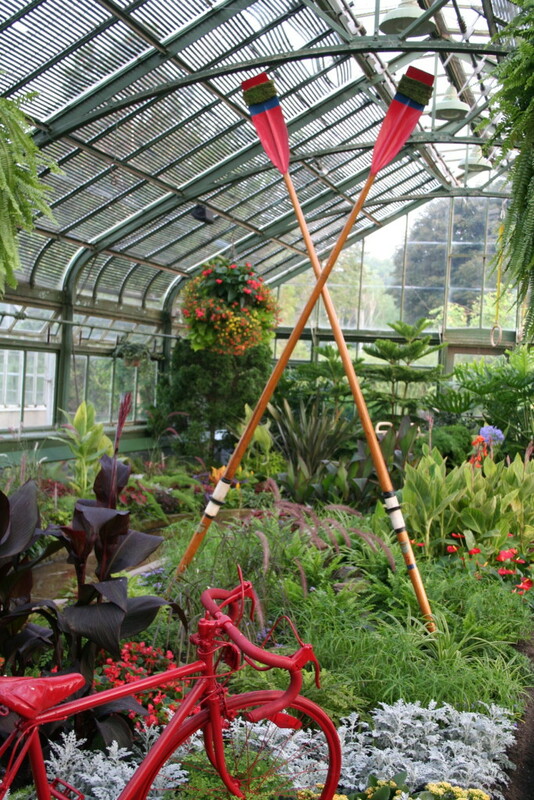 Generally, balance is achieved by following a 1:1 or 1:2 pot to plant height ratio rule. Relate the size of the container to the number of plants that will comfortably grow to fill the space. Think two months down the road and give them enough room to grow. Yes, the container will look a bit sparse at the start but the plants will be healthier this way. I haven’t seen any ready-made containers at the nursery that weren’t planted too full and wouldn’t need serious “editing” two weeks later. Don’t fall into this trap too. Choosing suitable plants can’t be stressed enough. Conditions are tough for plants growing in a container so don’t pick wimpy plants that need tons of pampering (i.e. : watering twice a day during the summer) to survive. Also make every plant count in the container. Since space is limited every plant must contribute, be it for texture, contrast, foliage color, flower power, scent or seed pods. The smaller the space the more critical good planning about plant selection is! What colors are preferred? Do you like restful and harmonious (blue, purple, pink) or hot and bold (orange & red) colors? Also consider the dramatic effect of contrasting leaf textures, shapes and sizes. Consider how your community of plants will react to each other. Are all plants compatible? Are they all shade loving, like moist soil, or acidic soils? The more they tolerate similar conditions, the happier they will all be in the container. 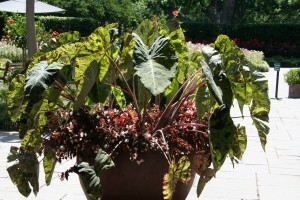 Terra cotta is a traditional container material that might be hard to use in the garden but with the right complementary plant foliage colors, a dramatic display is possible for the patio. Next think about the maintenance requirements of your containers. Are you willing to water 3x a day, which may be required if growing a large, thirst plant in a small pot? This is important! 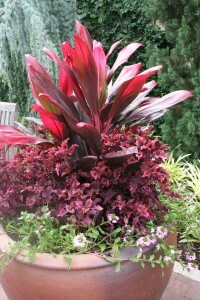 Plants in containers require more attention than plants growing in the ground. Here are several good tips to consider if you aren’t willing to commit to watering containers at least once a day during the hottest part of the summer. Use extra large containers, add water-holding polymers to the soil, use mulches, add more compost to the soil, install drip irrigation, garden in the shade or semi-shade, and using glazed containers will help conserve water so that containers won’t need such frequent watering. Consider the size. Can it be moved? Larger containers hold moisture longer, but they do get heavy. Two recently watered, large containers ended up being too heavy for me to move into the garage ahead of plummeting temperatures last fall and I had to take my chances that the plants would survive snug against the house (luckily they did). Larger containers have more room for root growth which means healthier plants. Don’t skimp on container size, even shallow-rooted vegetables like lettuce, radishes, beans, and peas should have at least 6” of soil and will often grow much better in deeper soil. Consider container stability. Does it have a narrower base and will be blown over in the wind? Watch out for tall, top-heavy plants that will make the container even more unstable. Is drainage needed? For all plants except water gardens, drainage holes are critical. Plan to have at least one hole (>0.5 inch) for every 6 inch base. It is recommended that a 30 gallon container have at least eight drainage holes (of 1 inch diameter). Pot feet or bricks are used to raise containers above the ground and help significantly with soil water drainage. They also decrease the chances of soil pests entering the container and the risk of rot with wood containers or decks. In hot environments, the color of the container should be considered. Is it light colored and will reflect, or dark and absorb heat? Scour flea markets, garage sales and antique stores. There’s no reason for boring planters. How much fun would it be to create a garden in a rusted out wash tub? Terra cotta stove tiles are also a great container material, or a beat up mailbox, leather boot or wooden shoe, leaky aquarium (now technically a terrarium), rusted out watering can, weathered straw garden hat … well the possibilities are almost endless. Look around and you may find tropical plants like this asparagus fern that are perfect for your next moveable garden. Many other tropical plants, flowering annuals or perennials and even compact vegetables work well in containers. 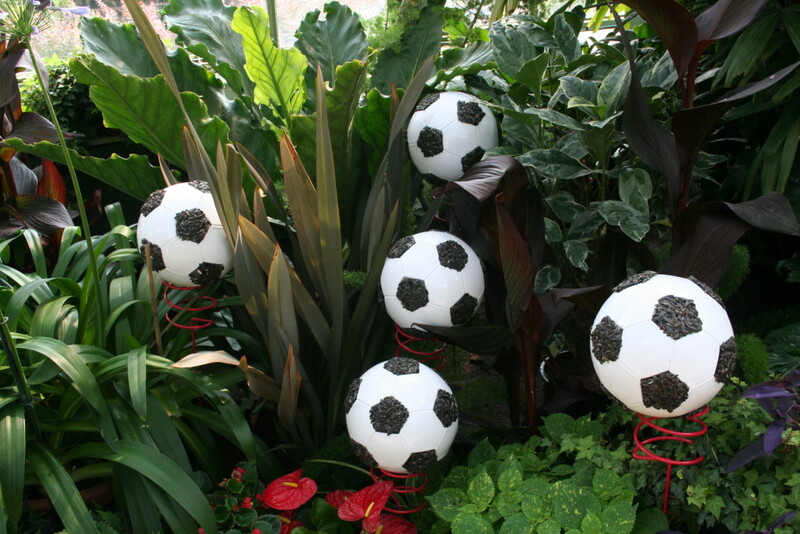 Add some dramatic impact to your next garden plans. When I plant a container, I have yet to find a packaged soil that I don’t feel I have to modify. Either they are too peat mossy and need some compost or they are too heavy and need sand or vermiculite to lighten them up. So I end up mixing up my own recipe. My advice, mix your own too! For organic growing, unless you know and trust your supplier, you are better off making your container mix with your own soil. Here’s a basic recipe: finished, sieved compost (4 parts), coarse sand (1 part), vermiculite, perlite or turface (1 part) and a recommended amount (from the label) of slow-release, granular organic fertilizer. This recipe can be adjusted with additional of peat moss or shredded coir, ground limestone, superphosphate, kelp, etc. depending on soil tests and the type of plants being grown. might break down over time from UV rays. Vegetables: lettuce, some tomatoes, peppers, eggplants, chard, pak choi, potatoes, cauliflower, broccoli, carrots, garlic, cucumber, onions, cabbage, beets, kohlrabi, green beans, spinach, turnips, some squash. Check out the new mini vegetable cultivars for containers. Don’t overlook mixing vegetables and flowers together and the benefits of companion planting.